We decided to cut up some rolls to turn into bread for our pasta dinner tonight, but oh what to put on them? Instead of just trying to decide on one thing, we went for four…and that was about the best idea ever. Option one was simple: a little butter and some granulated garlic bread. Should have added a little salt, but good none the less. Option two, and better than one, was the basil pesto option. I had actually found some pesto in a jar that I can keep in a jar and it works just as well as the fresh stuff. Almost tastes better to, because it has time to marinate. Option three, we added cheese. Just a little olive oil, and some Havarti cheese on top. I haven’t had Havarti prior to a couple days ago, but it has a yummy, creamy consistency and a buttery texture with a smooth taste. Come to find out, it melts extremely well. Option four, which I rate number one, was the mixture of the Havarti and the pesto. The creamy taste with the tangy pesto was a perfect combination on the crunchy bread. Overall, serving it with pasta, you just can’t go wrong. Our house guest was graciously “allowed” to make dinner in my kitchen, and I’m glad that I let him. This turned out amazing. 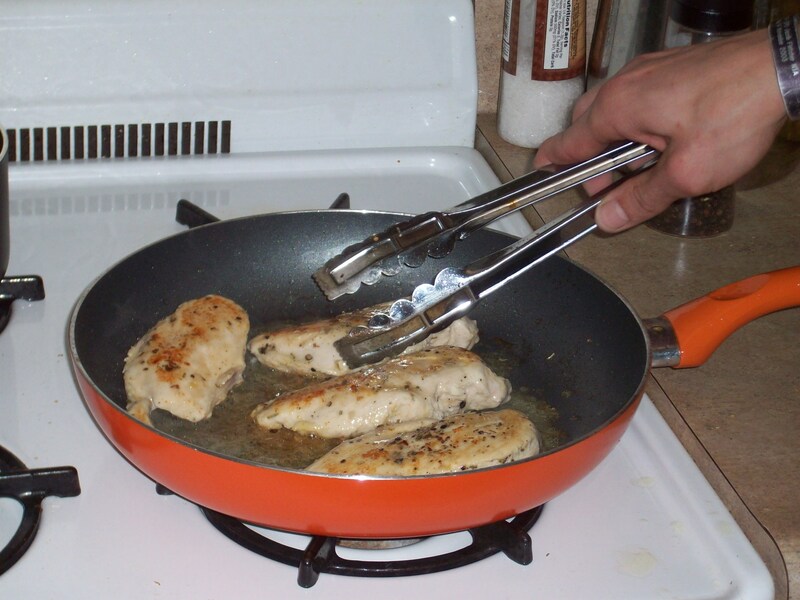 The chicken breasts were sauted in olive oil and white wine – which tastes good for drinking with the meal too – with rosemary, salt and pepper, as well as some minced garlic. He let me help him out in the kitchen making the rice. We added oregano, thyme, rosemary and parsley. The parsley was fresh, so it brought out the flavors of the other spices. The chicken as it was cooking, right after adding a smidge more wine. 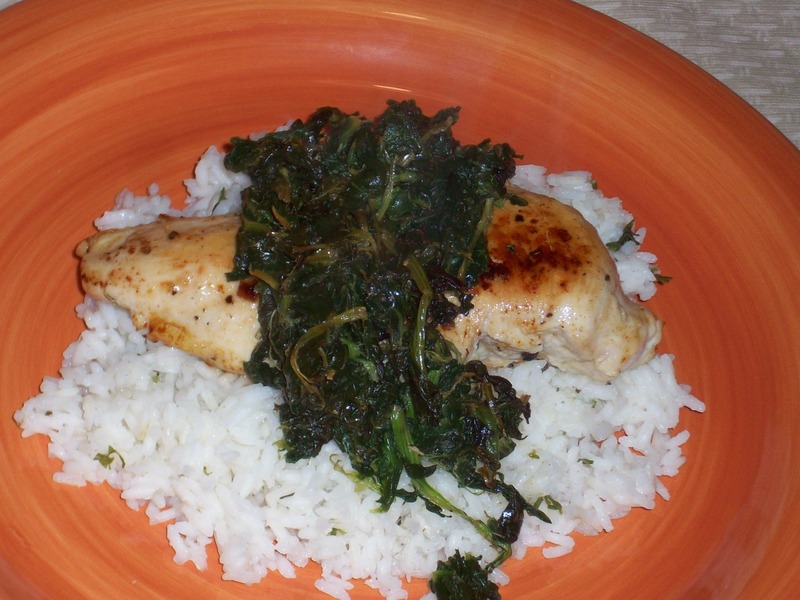 Once the chicken got done with its crispy glazing process, he sauted spinach in the pan with the drippings until it was just wilted and slightly crispy on the thin pieces. Not enough to be crunchy, just enough for a change in texture. He told me I could feel free to experiment with his recipe, but I really don’t feel the need to. The only thing that I might have added (not changed) is some balsamic vinegar to the bottom of the chicken pan prior to adding the spinach for some mild sweetness/tanginess. So..thanks to a certain Italian chef on Food Network, I got the bright idea to try and fry up some of the broccoli and cauliflower that has been sitting in my fridge for a very long time. She dipped hers in egg, then coated it with Parmesan, and dumped it in the oil. Well I did things a little different, starting with oil. She only used olive oil. I used canola. And I also used Asiago Romano cheese, because I didn’t have fresh parmesan. Big mistake, on both counts. The broccoli was good, but the cauliflower? Blech. Not going to be inventing things with that recipe again. Though it did work to get them out of my fridge, except for the little baggie I kept as my snack. That title? Just means eggplant parmesan with meat. But I got it out of a cookbook of Italian favorites, and it is so good. I don’t think I’ve had eggplant parmesan that good. And I’ve never had it with meat. The recipe calls for a couple things I didn’t have, so I improvised with spices. And took down the amount of some ingredients. Either way it was so good! 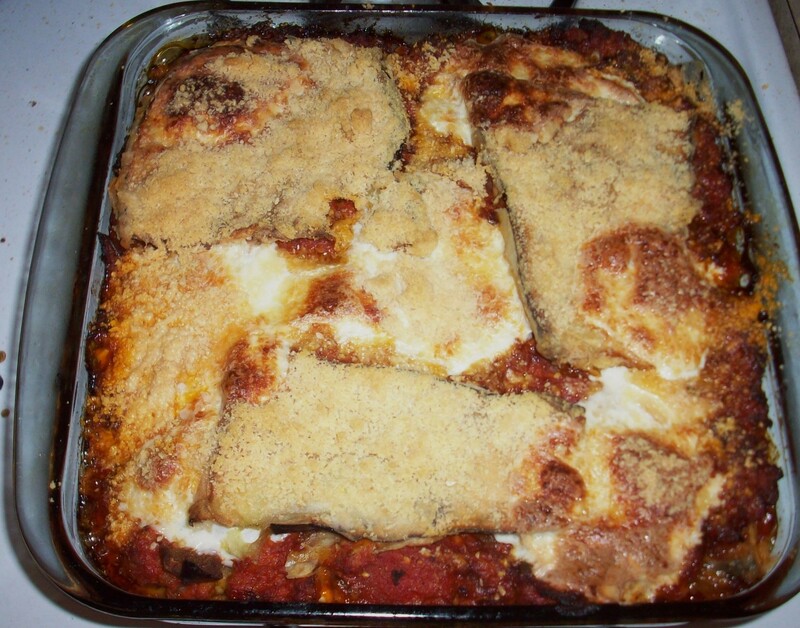 The eggplant parmesan after it came out of the oven, cheesy and bubbly. The changes I made from the original recipe include not adding italian sausage – I added italian seasoning, basil and rosemary, as well as a little chili pepper for some heat. I also used ground turkey instead of ground beef, which saves me some calories. I didn’t have enough mozzarella or fresh parmesan, so it probably isn’t as cheesy as the recipe originally intended, but it was still good. The recipe also calls for canned tomatoes, which gave the meat a sweet taste. Overall, I give this recipe an 8 out of 10. It’s not the healthiest, but it is filling, and tastes amazing with a salad. If done exactly to the recipe, it would probably be even better. So, what I did: a pound of ground beef – I’m sure ground turkey would work too – goes into a bowl, to which I added my scrumptious garlic mustard, ground oregano, steak sauce, and Worcestershire, just a bit of each (equal parts of the steak sauce and Worcestershire though). Afterward, I caramelized onions and mushrooms, then some bacon that was chopped into little pieces. I took a quarter of the meat, divided it in two, and flattened it to make a patty shape. Then I put some of the onions, mushrooms and bacon, as well as two little cubes of cheese into the middle, and took the other half and shaped it on the top. I made sure the edges were closed up, and then patted it a bit flatter so it would cook evenly. I repeated the process for the other three quarters, broiled them in a pan until the edges weren’t pink anymore (which meant that the middle was still a tad pink), and served them on onion buns with mayo, mustard and ketchup. Mmmm tasty! I’m betting that other ingredients in the middle would be pretty tasty too, or even just cheese. If I had some guacamole, that would have gone on top, to make a bacon avocado burger. Like I said, easy.